The UNESCO has given the World Heritage Site recognition to two entities of the Indian Railways -- the Mountain Railways of India and Chatrapati Shivaji terminus. Kalka- Shimla Railway in Himachal�s Shivalik Mountains is a narrow gauge stretch and finally the Darjeeling Himalayan Railway in West Bengal (another narrow gauge). In the year 2003, the IR made into the Guinness Book of World Records by laying a a railway line at steepest rise in space covering 96 km. Gwalior Light Railway (Maharaja Railways) covering a distance of 198 km between Gwalior and Sheopur is a 610 mm wide narrow gauge line and is poised to get the World Heritage Site tag from the UNESCO. Another historic route is the narrow gauge line linking Matheran, the Neral-Matheran Railway. �Palace on Wheels� is a specially designed locomotive steam train by Rajasthan government to boost tourism. Likewise Maharashtra has put in place �Deccan Odyssey� that connects all tourist places, sites in the state and Goa to facilitate easy travelling and sightseeing. Not to be left behind, �Golden Chariot Train� was launched by Karnataka to link tourist spots in Goa and Karnataka. But all these luxury trains aimed to woo global tourists had failed to gain the popularity of �Palace on Wheels� which has received global acclaim. �Buddhist Circuit Train� also known as �Mahaparinirvan Express� was introduced by the Ministry of Railways to woo Buddhist pilgrims. This train halts at Kushinagar, Varanasi, Bodhgaya, Lumbini and other Buddhist holy places in India. Samjhauta Express train connects Pakistan and India via the open border in Punjab. This route was closed due to hostilities in 2001 between Pakistan and India. It was later opened in 2004. Khokhrapar in Pakistan is linked with Munabao in India through Thar Express. This route was closed at the time of Indo-Pak war in the year 1965. It was later opened on February 18, 2006. �Hospital on Wheels� is a lifeline express that travels across rural India to deliver healthcare to the people. This train consists of carriage used as operation room, a store room and additional two rooms that functions as patient wards. This train stays for two months at a place before moving on to other areas. �Fairy Queen� is one of the popular and oldest locomotives in India and is operational only for special delegates travelling from Delhi to Alwar. Older than this is John Bull which was operated in 1981. Kharagpur station is considered to be the world�s longest rail platform at 3,517 feet (1,072 m). 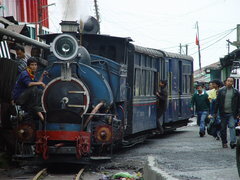 The Ghum station on the route of Darjeeling Toy Train is the second highest railway station to be linked by locomotive steam train in the world. The Deccan Queen running between Mumbai and Pune has the oldest functioning dining car in the Indian Railways. Vivek Express connecting Dibrugarh in Assam with Kanyakumari over a distance of 2,663 miles (4,286 km) with a journey time of 82 hours and 30 minutes is the longest running train in the IR on the basis of time and distance. The second longest running train on the basis of time and distance is the Himsagar Express connecting Kanyakumari with Jammu Tawi. This train covers a distance of 2,308 miles (3,715 km) in 69 hours 30 minutes. Bhopal Shatabdi with a maximum speed of 93 mph (150 km per hour) on Faridabad-Agra section is the fastest running train in India. The maximum speed attained by any train during test drive is 114 mph (184 km/h) in 2000. Navyug Express is the third longest running train covering a length of 3,609 km between Jammu Tawi and Mangalore. Trivandrum Rajdhani running between Kerala�s capital and New Delhi (528 km) is the longest non-stop train being operated by the IR. The longest and non-stop train operated by Indian Railways is the Trivandrum Rajdhani running between Delhi and Trivandrum covering 528 km. Double-decker AC trains have been launched. The Pune-Mumbai Sinhagad express is the first double decker train offering a new range of flexibility in accommodation. In November 2010, the IR launched their first double-decker AC train between Howrah and Dhanbad with two power cars and 10 AC coaches. Indian Railways commemorated its 160th anniversary on April 16th 2013 by commuting 23 million people. Konkan Railway Corporation Ltd (KRCL) has been sanctioned as a central PSU by the Indian Railways to construct the world�s tallest railway bridge over the Chenab River in the Reasi district of Jammu and Kashmir. This project is expected to be completed by 2016. This railway bridge over Chenab river is critical for the Udhampur-Srinagar-Baramulla Rail Link (USBRL) project. It is one of the national projects that was aimed to offer rail connectivity to the northern most state of Jammu and Kashmir. Konkan Railway has already begun the construction process in their USBRL project between Katra and Dharam. Indian Railway is constructing the highest rail bridge over Chenab, in J&K Five times the height of Qutub Minar, it will be taller than the Eiffel Tower. Loco-pilots (train drivers) are paid more than an average software engineer Salaries are the tune of Rs. 1 Lakh per month and more. The slowest train goes uphill at the speed of 10 kilometers per hour You can jump off the train, light up a smoke, take few drags and climb on the train again. It's the Mettupalayam Ooty Nilgiri Passenger train. Its 161 years old! 16 TH April, 1853. That's a long time ago. The station with the longest name is Venkatanarasimharajuvaripeta And it's sometimes spelled with 'Sri' prefixed. Quite a mouthful. The shortest distance covered between two successive stations is 3 kilometers It's between the Nagpur and Ajni station. A train covers a distance of 528 km without a single stop It's Trivandrum � H. Nizamuddin Rajdhani Express. Indian Railways transports almost 2.5 crore passengers daily That's nearly the total population of New Zealand, Australia and Tasmania put together! The Rail Museum in Delhi is the largest in Asia It has working and non-working models both.